We have an impressive group of stallions that I think can make long term impacts on the future of California breeding. I feel it is important that you take a look at our stallions in play for this season. I want to give you an opportunity to come to Harris Farms on Saturday, January 19th to view the stallions. While pedigrees, nicks, etc. may be important, there is nothing as key as seeing a sire in person that you may be staking your mare’s future, plus your own racing and breeding successes on. Plan on joining us on January 19th for a productive day that can shape your racing future into the next decade. We will start at noon with a video presentation of our sires and some of their progeny’s race records, which will occur over lunch at the Restaurant in the Farm Room. We will then adjourn to our stallion barn, about a 15-minute drive away, to see the 11 stallions standing here for the 2019th season. You’ll be able to assess what confirmation type you like, and how that may best blend with your broodmare. Some of our key staff members will be there to answer any questions and have information regarding the stallions. We will then move back to our Restaurant/Inn for a hosted reception which will include some remarks on the overall California breeding industry, and a good discussion including all present. I have made arrangements to provide a 40% discount off our normal room rates for California breeders should you wish to stay over either Friday or Saturday (the 18th or 19th). Contact the Inn directly at 559.935.0717 or via the Internet at www.harrisranch.com to make your own arrangements. The day will also be a good chance for you to meet Jonny Hilvers, the new GM of Harris Farms. Best wishes for a happy and winning New Year. Albany, CA (December 8, 2018)-In the $63,125 first division of the Miss America, Lynne’s Legacy unleashed a strong closing kick to rally from last to first. Winning rider Alonso Quinonez was content to sit back early on the 5-year-old daughter of Unusual Heat. She is the fiftieth stakes winner for her sire. “That’s the way she runs races, I was going to do that no matter what. I got a perfect trip,” he said. Lynne’s Legacy was last in the field of eight as Savannah Slew set the early pace. The front-runner was challenged and overtaken by Birdie Gold into the stretch, but the new leader was no match for the late-running Lynne’s Legacy, who split horses in the lane, defeating Fiery Lady by 1 1/2 lengths. Birdie Gold was a head behind the runner-up in third. The winning time was 1:44.08. Lynne’s Legacy was claimed away from trainer Doug O’Neill two starts back at Santa Anita for $40,000. In her next start, on Nov. 22 at Del Mar, two of the original owners, Maureen Richardson and Steve Rothblum, joined by Ritchie Robershaw, teamed with O’Neill to claim her back for the same price. Her win Saturday was worth $39,450 to the group. Going into the Miss America, Lynne’s Legacy had made 27 of her 28 career starts on turf, but when the race was moved to the synthetic main track, the connections decided to stay in the race. Lynne’s Legacy has now won 5 of 29 starts with total earnings of $305,780. https://harrisfarms.com/wp-content/uploads/2016/03/harrislogo.png 0 0 none https://harrisfarms.com/wp-content/uploads/2016/03/harrislogo.png none2018-12-09 10:13:482019-01-21 13:36:59Harris Farms Bred Lynne’s Legacy Rallies for Win In Miss America S.
COALINGA, Calif. (Dec. 5, 2018)-Combining over 100 years of leadership and excellence in California and national racing, John Harris’s Harris Farms and the Johnston’s family’s Old English Rancho are joining forces to keep California racing and breeding strong. Stallions now will all be located at the Harris Farms facility near I-5 about midway between the Bay Area and the Los Angeles area include: Acclamation, Clubhouse Ride, Desert Code, Jeranimo, Lakerville, Majestic Harbor, Mr. Big, Prospect Park, Smiling Tiger, Tamarando, and Vronsky. Both farms utilize over 700 irrigated acres or irrigated pasture for boarding of broodmares as well as stallions, and the development of yearlings. Jonny Hilvers, the general manager of Old English Rancho for 8 years will become General Manager of the newly combined entity. Hilvers, 33, a Sanger native is the grandson of popular California owner and breeder, Buddy Johnston and great-grandson of Elwood “The Pie Man” Johnston, the founder of Old English Rancho, a dominant force in California racing and breeding for decades. 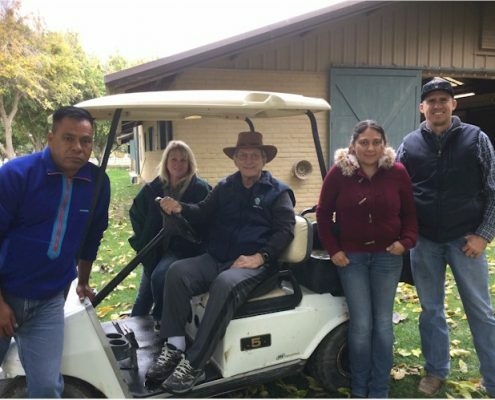 Harris Farms owner John Harris, a 1965 graduate of the University of California at Davis is a farmer, a cattleman, a beef processor, a restaurateur, and an enthusiastic owner and breeder of thoroughbreds in California for over 50 years. He has been a member of The Jockey Club since 1984, still serves on the California Thoroughbred Breeders Association Board and is a former Chairman. He was inducted into the Thoroughbred Hall of Fame in 2008. He is also a prominent owner and breeder, having bred numerous California Champions and Grade One Stakes winners Alphabet Kisses and Cost of Freedom. Although breeding predominantly to race, he has sold several sales toppers in recent California yearling and 2-year-old sales. Harris was Chairman of Bay Meadows Racing Association in the mid-1990s. Dave McGlothlin, who started managing Harris breeding stock in 1981, will remain as a consultant. Per Antonsen, farm trainer for many years will continue in that role. At Harris, he was key in the early training of Champions Tiznow and California Chrome, and many other California champions. Raul Rosas, a 30 plus year horseman who has handled all the top Harris stallions remains at Harris as stallion manager. 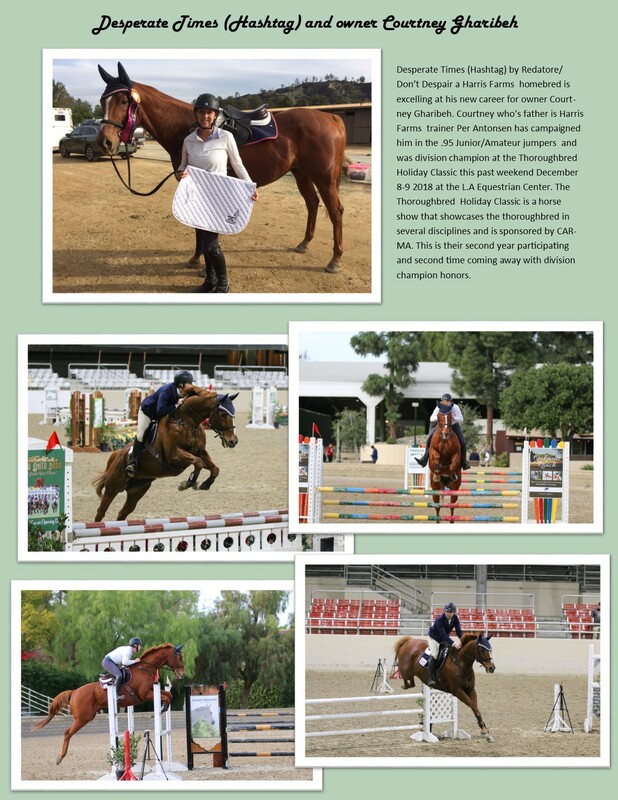 Dr. Jeanne Bowers Lepore, a graduate of the Veterinary School of the University of California at Davis has been a well-respected veterinarian for many years, and has overseen Harris Farms equine health since 1997. She is assisted by her associate Dr. Virginia Hernandez, as well as newly arrived Kristen Phillips and Ana Celdran. Debbie Sue Winick will remain as Office Manager and Customer Relations specialist. Debbie is a former Paymaster of Purses at Bay Meadows and was an Executive Assistant at California Thoroughbred Breeders Association. Laurie Brown, a key player for Harris for the last several years, manages the River Ranch operation near Sanger, assisted by Lindsay Miller. Patricia Langden is foaling manager and assists with sales preps, as well as overall equine health issues. John Harris commented, “I feel incredibly blessed to have such a fine group of people come together with the common goal of producing thoroughbreds that can compete at the very top levels. Now that the drought is behind us, and by adding additional pastures, we can give horses more room and expansive grass pastures to grow up on, while still having many smaller sized paddocks as options for various needs. I want to have the best facility, the best nutritional and health programs, the best people, and the most promising stallion roster in California. 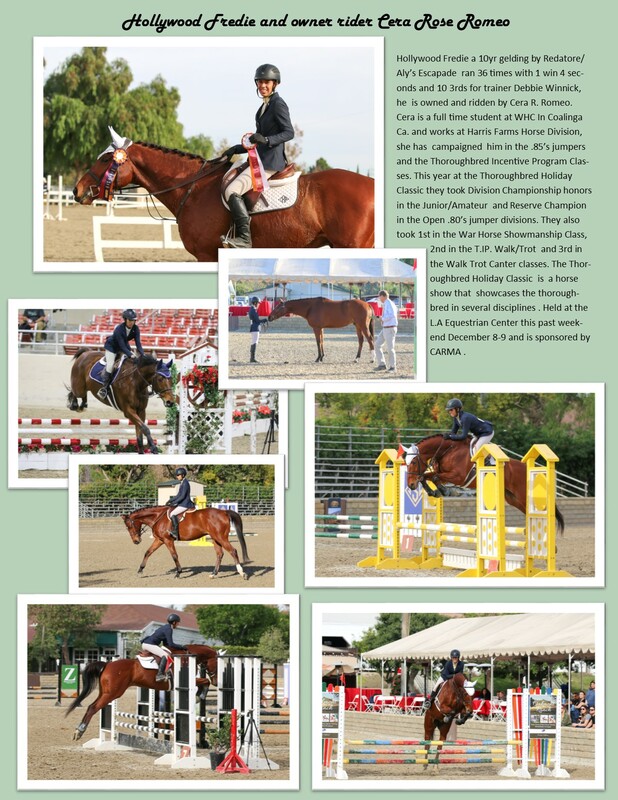 We want to be valued as a place to raise top horses. Jonny Hilvers will be a key ingredient to all of the mutual success I envision. He brings us solid leadership and practical excellence, and represents a new generation to help lead California forward”. November 19, 2018-Ace Korea produced a breakout performance to win the Kookje News Cup at Busan Racecourse on Sunday afternoon. The three-year-old dominated a field containing some of the nation’s best sprinters as he cruised to a two-and-a-half length victory. Coalinga, CA (November 16, 2018)-Prospect Park, winner of the G3 La Jolla Handicap at Del Mar, has been retired to stand at Harris Farms, Coalinga, California. 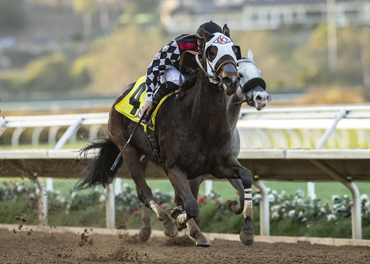 DEL MAR, Calif. (Nov. 11, 2018) — Perfectly placed by jockey Flavien Prat behind dueling leaders in the early stages of the $100,000 Betty Grable Stakes for Golden State Series eligible fillies and mares, Spiced Perfection surged between rivals to take command entering the stretch and drew off impressively to win the seven-furlong sprint by two and one-quarter lengths Sunday. Bred by Premier Thoroughbreds, Spiced Perfection, sent off at 4-1 odds, scored her fourth win in six lifetime starts at Del Mar and fifth in 13 career efforts, running the distance in 1:23.21. Runner-up was Just Grazed Me under Tyler Baze, with S Y Sky, the 2-1 favorite, third, a length and one-quarter farther back, and three-quarters in front of fourth-place Love a Honeybadger in the field of eight older California-bred fillies and mares. Mo See Cal was scratched. Spiced Perfection, a three-year-old daughter of former top sprinter Smiling Tiger, is owned by the Dare to Dream Stable of Michael Faber of Mundelein, Illinois and conditioned by Brian Koriner. She returned $10.60, $5 and $3.20 and earned $57,000 to increase her bankroll to $442,405. Prat also won the Betty Grable Stakes a year ago, aboard Majestic Heat. Just Grazed Me paid $5 and $3, while S Y Sky returned $2.80 to show. In addition to winning the Betty Grable Stakes, Koriner also saddled two other winners, for a rare training triple. He won the sixth race with Fast Cotton for a $4.20 payoff and the day’s ninth and final race with Gypsy Blu in a $63.60 upset.